THE PRESIDENT: Thank you very much. Please be seated. Thank you, Chaplain Hurley. 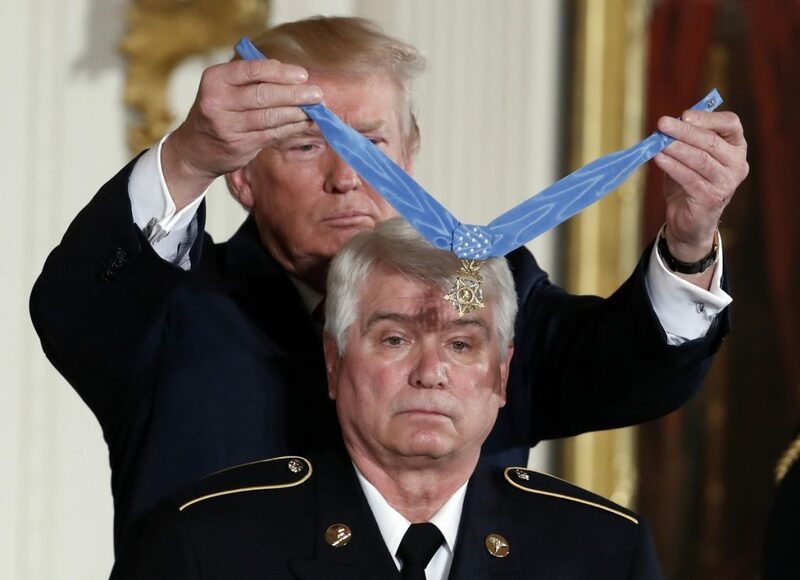 Secretary Mnuchin, Secretary Mattis, Secretary Shulkin, Senator Stabenow, Congressman Upton, and members of the Armed Forces: Thank you for joining us as we award our nation’s highest military honor to Specialist Five James C. McCloughan. Today, we pay tribute to a veteran who went above and beyond the call of duty to protect our comrades, our country, and our freedom. Joining Jim today is his wife Cherie, his brothers Mike and Tom, his sons Jamie and Matt, and many other members of his very large and beautiful family. We’re also gratified to be joined by eight previous Medal of Honor recipients. Now, Jim’s name will stand forever alongside theirs in our history and in our hearts. I want to take a few minutes to tell you about Jim and how he earned this place among legends. Jim was raised in Bangor, Michigan. His father built their house from scratch and worked 40 years at a piano factory. Jim’s dad taught him a simple but powerful lesson: Never do anything halfway. Always do your best. Jim took that lesson very much to heart. He played for four varsity sports in high school and three in college. On May 13, 1969, less than three months after he arrived, Jim was one of 89 men in Charlie Company to embark on a mission to secure a transportation route near Nui Yon. As Jim and his men jumped out of the helicopter, it quickly became clear that they were surrounded by enemy troops. Within minutes, two choppers were shot down, and one of his men was badly wounded in the middle of an open field. Jim did not hesitate. He blazed through 100 meters of enemy fire to carry the wounded and the soldier to safety. But this was only the first of many heroic deeds Jim would perform over the next 48 hours. After tending to the first wounded soldier, Jim joined a mission to advance toward the enemy, and advance they did. Before long, they were ambushed. Again, he ran into danger to rescue his men. As he cared for two soldiers, shrapnel from a rocket-propelled grenade slashed open the back of Jim’s body from head to foot. Yet that terrible wound didn’t stop Jim from pulling those two men to safety, nor did it stop him from answering the plea of another wounded comrade and carrying him to safety atop his own badly injured body. He was badly injured. And so it went, shot after shot, blast upon blast. As one of his comrades recalled, whoever called “medic” could immediately count on McCloughan. He’s a brave guy. As day turned to dusk, nearly all of those who could and really, really had to make it back — they were finally within their night defensive position, except for one soldier whose plea Jim could not ignore. Again, “Doc” did not hesitate. He crawled through a rice paddy thick with steel rain. That means bullets all over the place. As soldiers watched him, they were sure that was the last time they would see “Doc.” They thought that was the end of their friend, Jim. But after several minutes passed, Jim emerged from the smoke and fire carrying yet another soldier. He immediately badgered [bandaged] and fixed and worked, but he got the wounds fixed and lifted the soldier to a medevac helicopter. Over the next 24 hours, Jim fired at enemy soldiers, suffered a bullet wound to his arm, and continued to race into gunfire to save more and more lives. And yet, as night approached again, after nearly two days of no food, no water, and no rest, Jim volunteered to hold a blinking light in an open field to signal for a supply drop. He would not yield, he would not rest, he would not stop, and he would not flinch in the face of sure death and definite danger. Though he was thousands of miles from home, it was as if the strength and pride of our whole nation was beating inside of Jim’s heart. Jim did what his father had taught him — he gave it his all and then he just kept giving. In those 48 hours, Jim rescued 10 American soldiers and tended to countless others. He was one of 32 men who fought until the end. They held their ground against more than 2,000 enemy troops. Jim, I know I speak for every person here when I say that we are in awe of your actions and your bravery. But let me tell you one thing, and one more story about Jim. On the second day of that bloody fight, Jim found a few soldiers and a fellow soldier who had been shot badly in the stomach. He knew the soldier wouldn’t make it if he flung him on the back, so he lifted him up and carried him in his arms. In that moment, Jim offered up a prayer. He asked God, “If you get me out of this hell on Earth so I can tell my dad I love him, I’ll be the best coach and the best father you could ever ask for.” As he prayed, a great peace came over him. And if it was God’s will for him to live, he’d keep his promise to God as soon as he had the chance. Jim made it out of that hell on Earth. He made it; here he is. And the first thing he did when he arrived back on American soil was to say those beautiful words: “I love you, Dad. I love you.” Jim said those words over and over again for the next 22 years until the last time he saw his father, the night before his dad passed on. Today, I’d venture to say his dad is the proudest father in heaven. Jim fought with all of the love and courage in his soul. He was prepared to lay down his life so his brothers-in-arms could live theirs. With us today are 10 of the men who fought alongside Jim, and five of those he saved. To Bill, Randy, Mike, Joe, Kent, Robert, John, Charles, Michael, Orestes — thank you for your service and sacrifice. Stand up wherever you may be. Where are you? Where are you? (Applause.) Thank you, fellas. That’s great. For over two centuries, our brave men and women in uniform have overcome tyranny, fascism, communism, and every threat to our freedom — every single threat they’ve overcome. And we’ve overcome these threats because of titans like Jim whose spirit could never be conquered. That’s what this award is, and Jim’s life represents so well: America’s unbreakable spirit. It’s been 48 years since Jim’s battle in Vietnam. He is now a husband, a father, and a grandfather. He coached high school football, wrestling, and baseball for 38 years, just like he said he would. And he brought together every member he could find of his beloved Charlie Company. Specialist Five McCloughan: We honor you. We salute you. And with God as your witness, we thank you for what you did for all of us. Now I would like the military aide to come forward and read the citation. MILITARY AIDE: The President of the United States of America, authorized by Act of Congress, March 3rd, 1863, has awarded in the name of Congress the Medal of Honor to Private First Class James C. McCloughan, United States Army, for conspicuous gallantry and intrepidity at the risk of his life above and beyond the call of duty. Private First Class [James] C. McCloughan distinguished himself by acts of gallantry and intrepidity at the risk of his life above and beyond the call of duty from May 13th through 15th, 1969, while serving as a combat medic with Charlie Company, 3rd Battalion, 21st Infantry, 196th Light Infantry Brigade, Americal Division. The company air assaulted into an area near Tam Ky and Nui Yon Hill. On May 13th, with complete disregard for his life, he ran 100 meters in an open field through heavy fire to rescue a comrade too injured to move and carried him to safety. That same day, 2nd Platoon was ordered to search the area near Nui Yon Hill when the platoon was ambushed by a large North Vietnamese Army force and sustained heavy casualties. With complete disregard for his life and personal safety, Private First Class McCloughan led two Americans into the safety of a trench while being wounded by shrapnel from a rocket-propelled grenade. He ignored a direct order to stay back, and braved an enemy assault while moving into the “kill zone” on four more occasions to extract wounded comrades. He treated the injured, prepared the evacuation, and though bleeding heavily from shrapnel wounds on his head and entire body, refused evacuation to safety in order to remain at the battle site with his fellow soldiers who were heavily outnumbered by the North Vietnamese Army forces. On May 14th, the platoon was again ordered to move out towards Nui Yon Hill. Private First Class McCloughan was wounded a second time by small arms fire and shrapnel from a rocket-propelled grenade while rendering aid to two soldiers in an open rice paddy. In the final phases of the attack, two companies from 2nd North Vietnamese Army Division and an element of 700 soldiers from a Viet Cong regiment descended upon Charlie Company’s position on three sides. Private First Class McCloughan, again with complete disregard for his life, went into the crossfire numerous times throughout the battle to extract the wounded soldiers, while also fighting the enemy. His relentless and courageous actions inspired and motivated his comrades to fight for their survival. When supplies ran low, Private First Class McCloughan volunteered to hold a blinking strobe light in an open area as a marker for a nighttime resupply drop. He remained steadfast while bullets landed all around him and rocket-propelled grenades flew over his prone, exposed body. During the morning darkness of May 15th, Private First Class McCloughan knocked out a rocket-propelled grenade position with a grenade, fought and eliminated enemy soldiers, treated numerous casualties, kept two critically-wounded soldiers alive through the night, and organized the dead and wounded for evacuation at daylight. His timely and courageous actions were instrumental in saving the lives of his fellow soldiers. Private First Class McCloughan’s personal heroism, professional competence, and devotion to duty are in keeping with the highest traditions of the military service and reflect great credit upon himself, the Americal Division, and the United States Army.